Mobile trolley carts increase worker productivity. 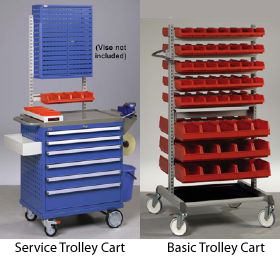 Have parts and/or tools mobile with these trolley carts. Casters enable the essentials that you stock in drawers or bins to be positioned at the worksite as needed. FOB Shipping Point. Product No. Description Size W x L x H Wt. (lbs.) Price Ea.